VWs waiting for WLTP testing in Berlin back in August. Things are not looking good for the supposedly most advanced and technically able auto industry in the world. The day of regulatory reckoning is here, in The Morning Shift for Tuesday, Oct. 2, 2018. 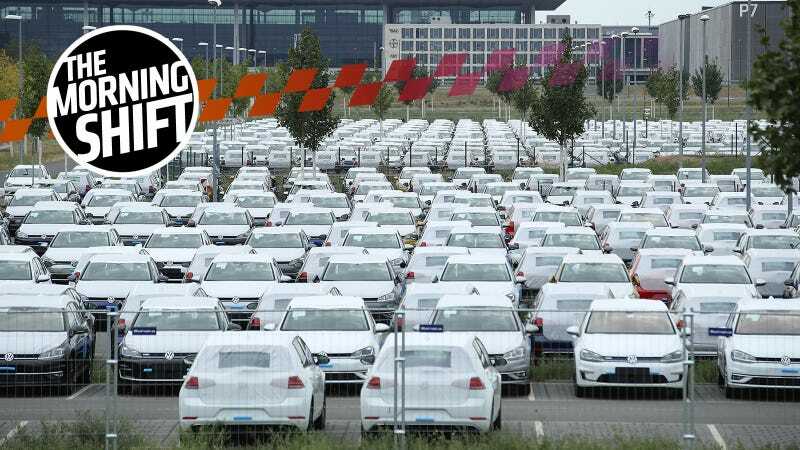 For months now the German auto industry has been fearing a new, stricter, set of emissions standards called the Worldwide Harmonised Light Vehicle Test Procedure (WLTP). Well, the main thing is that WLTP is supposed to be more realistic. Also, as carmakers like Volkswagen are quick to point out, individual models, engine by engine and trim by trim, have to get individually tested now. More realistic, but also significantly more time-intensive. This is what all of Dieselgate was about, the same with Dieselgate’s older brother called Cycle Beating—cars would technically pass emissions tests while being tested, but numbers wouldn’t match in the real world. Seriously, German carmakers have been wildly apprehensive about WLTP. They have been dumping cars on the market trying to unload cars that presumably wouldn’t pass. Other effects too: the VW Arteon got delayed in the U.S. because of bottlenecks with WLTP, something that the U.S. doesn’t adhere to. New car registrations in Germany fell 30 percent in September year-on-year, a source told Reuters on Tuesday, as manufacturers struggled to adjust to the new WLTP emissions testing regime. That’s the whole report. Not a ton to go on, but we’ll hear more as the day wears on. I am shocked. Again, the difference between WLTP and how things have been before is principally that it’s supposed to test cars closer to how they perform in the real world, as opposed to the old New European Driving Cycle (NEDC) that has grown seriously outdated over the years. The Paris Motor Show (rather, le Mondial de l’Auto 2018 à Paris) is on today and that means we get to hear auto industry execs make long speeches where they alternate between saying 1. Our company is being ruinously targeted by unfair regulation and 2. Our company is bristling with innovation that we totally wanted to do on our own because we’re so good you guys. Quoted in the Financial Times, Ghosn said that consumers buy cars based on price, running cost and resale value and “do not care” what engine their vehicles have. Renault has also confirmed its plans to further electrify its range in its 2020 product refresh cycle, offering hybrid on Clio and plug-in hybrid on Mégane and Captur. Ah, such great innovation. Wonder where Renault got that impetus from. Who can say. The German government did intone multiple times that it was the car companies that started this mess and it’s the car companies that should pay for it, but the precise details of how many euros each retrofit fix will cost and how much each carmaker will be able to cover makes it clear that the government will be subsidizing this to some degree. You, the consumer, should be able to expect a wealth of hybrid and all-electric cars on sale here in America by 2022, Automotive News reports. That’s a cool quarter century after Toyota first put the Prius on sale, 22 years after it first came to America and 23 years after the little Honda Insight debuted Stateside. It’s sort of generally understood that new technology takes about 25 years to fully integrate into the auto industry and that seems about right. Go to Automotive News to see the full list, which includes everything from the Hyundai Kona and Jaguar I-Pace this year to a hybrid Jeep Wrangler to, wait, this list includes the Elio? Oy. For whatever reason I remain fascinated with the business side of Aston Martin. Having left the clutches of Ford, it is a boutique sports car manufacturer not greatly unlike, say, Lotus. The company has worked out some interesting partnerships, like securing engines from AMG as of late, and has made some bold claims about going with EVs in the future, but Aston’s existence should never be taken for granted. The new goal is 18.50 to 20 pounds ($24-$26) per share, the luxury car maker said Monday in an emailed term sheet. It’s looking like Aston will end up not more valuable than Ferrari, but maybe right there on the same playing field, Bloomberg expects. Sure. Neutral: Is Something Like the WLTP Coming For America? I can’t help but feel like American emissions tests are more on the unrealistic side than not. What would happen if we had a WLTP-style reckoning here? And would that happen?